Nepalese village kukri, early to mid 20th century. Traditional scabbard with buttons for carry in waist sash (buttons loose, need to be reattached). Leather covering of the scabbard is most likely goatskin rather than the traditional water buffalo. 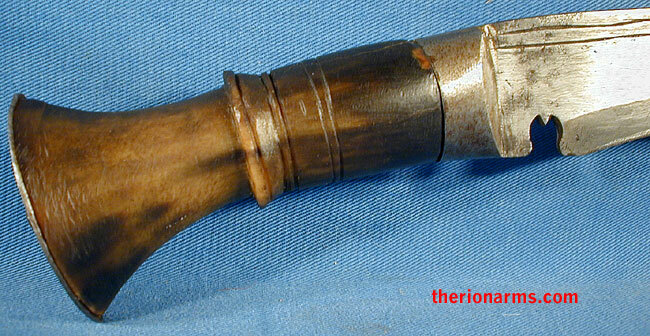 Unusual brown horn handle, steel bolster and buttplate. 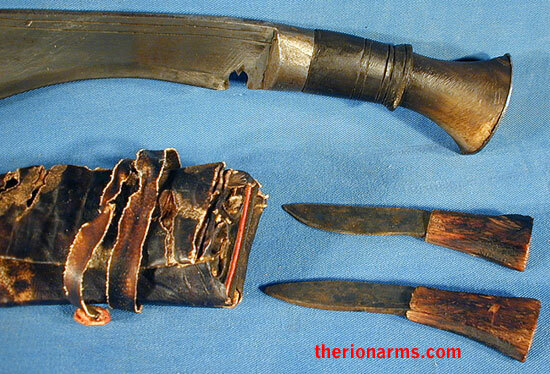 Crudely forged but heavy and serviceable wood-handled karda and chakmak companion knives. maximum blade width: 1 7/8"
bolster and grip: 3 7/8"